It’s gratifying to see an emerging trend that I had identified 18 months ago (Time Wars: Google vs. Facebook) come to fruition. To explore how this trend has evolved, I sat down with Phil to discuss his latest work. Amazon, Apple, Facebook, and Google have done nothing less than usher in a new era of doing business. While writing and doing research for The Age of the Platform, it became evident to me that the platform wasn’t just some different take on technology. It was an entirely new business model being embraced by thousands of organizations in many industries and of all sizes. It’s not just about four companies. 2) Platforms have been around since the 1980s and 1990s. Why is this different? Many reasons. First, the speed of technological change is orders of magnitude faster than years past. Social networks have allowed products, services, apps, and content to travel around the world in seconds. Partnerships, communities, and relationships can consummate in days via mutual self-interest, aided in large part by the proliferation of APIs and SDKs. More than the usual suspects, however, the platforms of Amazon, Apple, Facebook, and Google are mostly consumer-oriented. Microsoft, SAP, Oracle, and IBM are still important companies but they tend to focus on businesses. 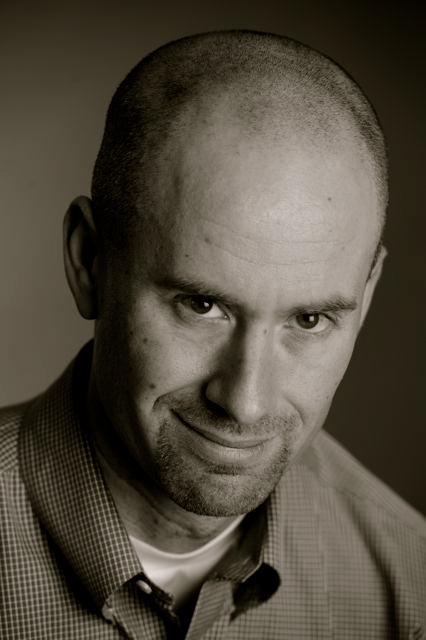 Few trends have been more important in the last decade than the Consumerization of IT. To be sure, B2B is still important but, in my view, consumers are driving a new technology revolution–and four companies are at the forefront of it. 3) Why did you choose to focus on the Gang of Four? I’ve run a small business for the last 10 years and started writing the book with a simple question in mind: If I had to work for a large company, which one(s) would it be? The answer was obvious: Amazon, Apple, Facebook, and Google. They are quite simply doing remarkably innovative things at speeds heretofore unseen. The Age of the Platform is not just about four companies. Each of the Gang of Four has tens if not hundreds of thousands of partners hawking their wares on and through their platforms. In one of the chapters in the book, I discuss emerging platforms such as Force.com, WordPress, Twitter, LinkedIn, and more. But beyond household names, there are scores of companies of which I never heard of extending these platforms in new and exciting ways. 4) What strategies should be pursued by large companies that are not in the Gang of Four? Well, that’s a big question. I look at the challenges of Netflix, Yahoo!, HP, Microsoft, and others and ask myself that question very frequently. At a high level, these companies need to incentivize prospective partners to develop what I call planks (integrated features, services, and offerings). A platform is nothing without planks, and Amazon, Apple, Facebook, and Google have each done an amazing job of giving developers tools to build apps, games, services, and the like. Trying to keep all of the innovation in-house is no longer an option. Next, build your planks. Realize that you’re not going to displace each of the Gang of Four in its core area—and there’s nothing wrong with that. Amazon and Apple don’t try to “out-Facebook” Facebook anymore than Facebook tries to do what Amazon does so well. Google added Google+ because it realized that it needed a social plank; I truly doubt that Page, Brin, and Schmidt expect to reach one billion users faster than Facebook. 5) What do small businesses need to do differently in the Age of the Platform? Many things; I cover that in some detail in the book. For one, it’s imperative that they use existing platforms as planks in their own. Not having a presence on Twitter, Facebook, and other social platforms is usually a big mistake. Google your own company and what comes up? If the result is nothing or a Yelp page, then it’s time to finally create a proper website. Astonishingly, nearly half of all small businesses lack a website. Also, realize the limitations of platforms. They are not elixirs. They will not supplant the need for a compelling offering, solid customer service, and other precepts of good business. 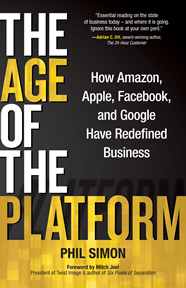 The Age of the Platform is a must read for anyone who seeks to understand competition in today’s economy. It identifies key elements that have made the Gang of Four successful and provides helpful lessons that can be applied to both large and small business. Ignore this book at your peril.